Cats unfortunately cannot sweat like humans can and will feel the heat in hot weather. Here are our top tips for keeping your cat a cool cat! There is some advice out there to keep your cat indoors between 11am – 3pm, but you try keeping a cat indoors, especially when it is hot and humid! A cat will rarely sit in the blazing sun anyhow and will find a cool spot to snooze and rest. As long as your cat can keep cool and has access to shady and cool places out of the sun, that is all that matters. Make sure that there is plenty of fresh drinking water for your cat so that your cat can have a drink when he/she needs to. Keep plenty of bowls of water indoors and outdoors in the garden. Cat fountains are great because it keeps the water flowing to give fresher water and encourages cats to drink more. It’s important to leave water for your cat at all times during the year, not just in hot weather. 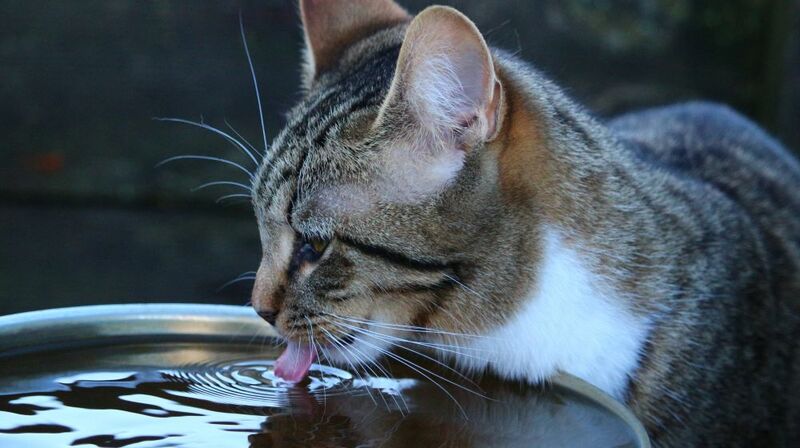 Older cats can be vulnerable to dehydration, so make sure you cat is drinking regularly. Cats will often disappear in hot weather and heatwaves to find a nice, cool and shady spot outside or inside. Make sure that there are cool, shady areas in the garden where your cat can rest out of the sun. You can rearrange plants and pots to create a cool spot, or move garden ornaments around to create shady parts. Cats prefer cool earth, wood or grass to lie on rather than tarmac, stone or cement which heats up and can get very hot in the sun. For an indoor cool space, you can draw the curtains in your coolest room in the house to make the room more cool and block out the sun. Cats like a breeze, so open a window, but please read our paragraph below about open windows that are high up. Replace any blankets or warm material bedding with a cool sheet, preferably cotton, so that their bedding is not too hot. Some cats like a wet towel to lie on, but check what your cat prefers. One of our cats loves to lie on paper or newspaper in hot weather, so you could even try that! You can put fans on for your cats with a wet towel near to the fan that will help to cool the air down as it blows. You can also buy cooling pads for cats (they are also available for dogs). A cooling mat has an inner gel lining that keeps the mat surface temperature cool in hot weather and is an ideal way to reduce your cat’s body temperature. Make sure that you buy a large enough cool pad for your cat to sit and lie down on and wipe it clean regularly. Grooming is important for cats, especially for those with long hair and extra fur. A cat will groom itself to keep itself cool, although this isn’t a very efficient cooling mechanism. A cat’s fur acts as insulation and keeps him or her from overheating. A coat that is smooth and tangle-free will help to protect your cat’s delicate skin and keep them cool. Give your cat a regular daily groom with a grooming brush so that their fur is smooth during the hot weather. 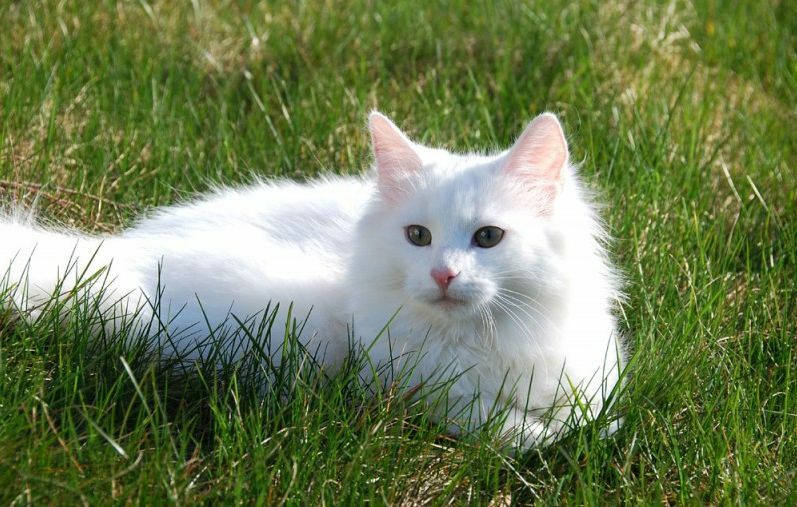 Cats that are pale and white in colour are extremely vulnerable to sunburn, particularly on their noses, ears and where they don’t have much fur to protect them. Other cats may have lighter and white parts, such as on their ears and snouts. Sun burn can lead to skin cancer in cats which may result in surgery, or in extreme cases, amputation. When your cat is outdoors, use a non-toxic sun block on your cat’s areas that are exposed to sun burn and check and apply regularly. You can use a non-toxic human sun block or a pet sun block. If your cat’s skin looks burnt, sore, crusty or with pus, then contact your vet immediately for advice. Kittens are active most times during the day, but it’s best not to over-exert your kitten in the hot weather. Rather than play with them during the day when it is hotter, play with them in the early evening when cool. Cats love a cool breeze and fresh air. If you have an indoor cat, then be very careful when opening windows in hot weather. Cats will jump from high windows and can seriously hurt themselves and in fact this is quite common during hot weather. Thousands of cats with serious injuries are treated every year after falling from heights when their owners open the windows. Sadly some do not survive their injuries. To prevent cats from danger and jumping from open windows you can consider installing tip and tilt windows that allow air into a room but not cats to get out. Alternatively a cheaper option is to secure netting or a screen across the windows when they are open to prevent cats escaping. Make sure that the screen is properly fixed and secure. When windows are open, you should regularly check your cat is not trying to get out and paw at the screen or window. Because cats don’t sweat like humans do, they find it hard to regulate their temperature. If your kitten or cat is panting or has a loss of energy, your cat may be overheating so keep an eye on them and if it persists or your cat or kitten appears distressed and lethargic, take them to the vet straight away. Signs of heatstroke include excessive and heavy panting, dribbling and collapse. If you suspect your cat has heatstroke, immediately move them to a cool place preferably with a draught or by a fan, wet their coat with cool not freezing water and contact your vet immediately.